Traffic jam has become an inevitable part of Dhaka's life and people are trying their best to adjust to it. Tamara hurries down from her office in Purana Paltan, two and half hours before the usual office recession time during Ramadan. She has promised to pick her sister up from her university at Banani, do a little shopping at Gulshan, pick a friend from Farmgate and join another for iftar at Dhanmondi. 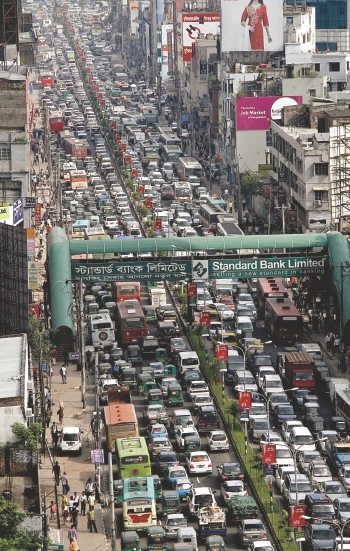 Everyday about a hundred vehicles obtain registration in Dhaka. Anyone who lives in Dhaka today will consider Tamara's plan for the day over-ambitious. Tamara's entire route covering a maximum of 20 km should take about two hours at best on any four-wheeler running at average speed in a free-road. However, the irony is, Dhakaites will roll their eyes and laugh when they come across this estimate. Traffic jam has become such an inevitable part of our lives that we now calculate distance taking the heavy traffic into consideration. When asked about the distance to a place, a common answer comes out as such: “One hour normally but two, jam inclusive.” In addition to redefining time and distance with the externalities of traffic jams, Dhakaites have started to adjust their lives accordingly. University student Risal often prepares for his quiz sitting inside city buses while on his way to attend classes. Similarly, Parisa Islam, lecturer of Eastern University utilises the hours stuck in traffic by checking assignments and preparing lecture notes. “If I can't find anything else to do, I softly recite duas,” she adds. Sports reporter of Independent news Aantaki says that she does her conceptual work in the micro-bus while returning to office from the reporting venue. “Arriving at office I do not have to wait long to go on air,” she explains, implying how her time spent at office work is actually saved by the jam. For Bangladeshis, it is easier to get these tasks done, since there is always the driver at the wheel to keep an eye on the road. Technology has further made the traffic hours more endurable. It is very common to find people typing away at their laptop or on facebook or solving business problems over their mobiles while waiting patiently at the traffic. Sadia, visiting from the US, has accustomed herself with the traffic by reading and listening to lectures on different topics of interest in her i-pod. However, for most people, napping is the most favourite thing to do, while stuck in a jam. Young Tonmoy who spends most of his nights chatting online and on facebook, uses the bus journeys between his class and tuition for slumber, though he risks the possibility of getting mugged. English medium student Rakib has virtually made his car a mobile home. Every morning he packs his lunch and snacks and a set of clothes before starting from Old Dhaka for his school at Dhanmondi. “I sometimes change my clothes inside my car before going to the coaching centre. Sometimes, I take a shower at a friend's house or hang out there to spend the time between school and coaching,” he says. Rakib does not return home in between school hours and coaching to avoid the notorious traffic of Old Dhaka. Bigger adjustments are being made by businesses and organisations. The Rotary Club of Kawran Bazar Dhaka had scheduled their weekly meetings at the Panshi restaurant of Dhanmondi. After a meeting or two when most of the members started complaining about the impassable traffic of Mirpur Road, the club shifted its venue back to Dhaka Club, at Shahbag. Saiful Amin Khokon, CEO of SS enterprise is shifting his factory from Ashulia to Demra. “I live in Central Road, Dhanmondi and in normal times it should take me about one and half hours to reach my factory from Ashulia. Now even if I start at 9 am, it takes me about two to four hours to reach my destination. I have another factory at Demra and it becomes impossible for me to visit these two places in a day. So we have decided to shift one factory,” he says. Romela, begging at the same intersection for the last ten years, is not too happy with her income this year. “People do not give alms anymore. Plus I have heard that we will be evicted by the police soon,” she complains while climbing into the safety of the island as the green signal lights up. In spite of her complaints, the number of beggars at any crossing has notably gone up just like it does every year before Ramadan. Perhaps Romella's trade is facing stiff competition from the new flux of alms seekers. Yet the situation is far from improving. 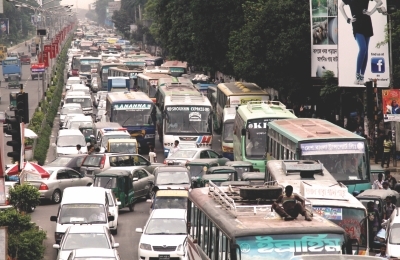 Based on BRTA (Bangladesh Road Transport Authority) statistics the total number of registered vehicles in Dhaka has increased by more than 83 percent over the last five years. Everyday about hundred vehicles obtain registration in Dhaka Metropolitan Area, according to official estimates. The construction of new roads in Dhaka to match this growing number of vehicles is negligible. Md Sirajul Islam, Chief Town Planner, Dhaka City Corporation says, “Ideally there should be 25 percent road in a city area. Dhaka has only 7 percent and it is not adequate. Dhaka had lost its carrying capacity of transportation years ago.” He opines that the only way things can be brought to normalcy is by discouraging the use of private cars and enhancing mass transit system. Considering Dhaka's traffic and our amazing way of adapting our lives to its consequences, soon we may hit the international news as the most resilient and adaptive race on earth. Perhaps Tamara's last minute change in plans stands as proof to the case. At about 6 pm while sitting in the VIP road crossing at Sonargaon, she changes her iftar plan to dinner at Dhanmondi. For iftar, she calls up another friend living at Bailey Road because going there from Sonargaon crossing is much easier than driving all the way up to Sheraton for a U-turn and then braving the traffic in front of Bashundhara City and Mirpur Road to enter her actual destination, Dhanmondi.